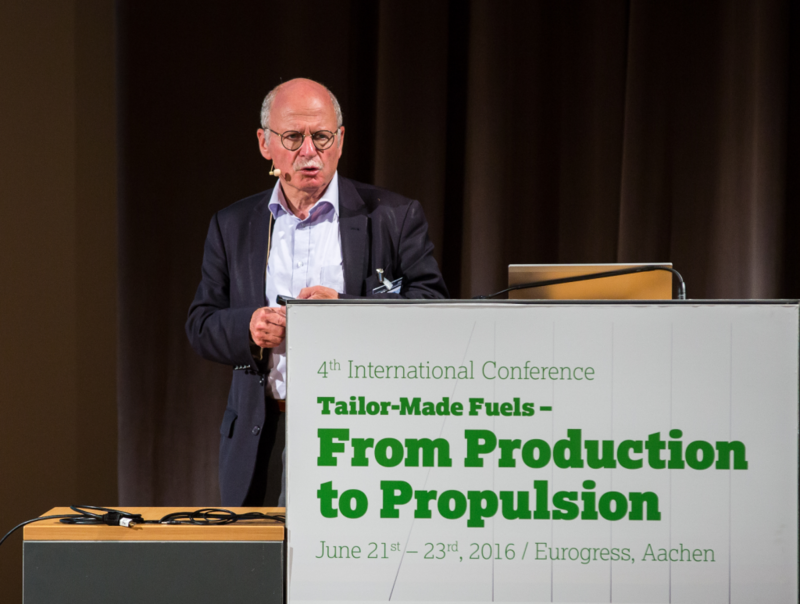 The 4th International Conference on Tailor-Made Fuels from Biomass (TMFB) organized by the Cluster of Excellence was held from June 21st to 23rd in Aachen, Germany. Nearly 200 scientists took the opportunity to discuss the synthesis, production and combustion of modern biofuels and for the first time alternative fuels derived from carbon dioxide as well as from renewable electricity made up one additional focus of the lectures. Internationally renowned experts as well as TMFB members presented their findings and current research activities within the Cluster of Excellence. The program also contained a poster session, which included a poster award for the two most convincing posters. As in previous years, a framework program providing the chance of networking and thinking outside the box of the own discipline completed the conference. Prof. Uwe Schröder from TU Braunschweig started off this year’s conference with a lecture on the opportunities and challenges of producing biofuels using electrochemical catalytic processes. He focused on new electrochemical reduction pathways for the transformation of biogenic platform molecules to possible fuel candidates including: (1) levulinic acid to valeric acid or octane; (2) 5-hydroxymethylfurfural to 2,5-dimethylfuran; and (3) fatty acids or triglycerides to Diesel‑like olefin/ether mixtures. Prof. Schröder’s work highlighted how the conversion of biomass using electrochemical routes can produce potential fuel candidates that cannot be readily obtained using chemocatalysis and provides a method to chemically store excess renewable electricity. The second keynote lecture this morning was presented by Prof. Johannes G. de Vries from the Leibniz Institute for Catalysis (LIKAT) in Rostock, who outlined his quest towards the ‘holy grail’ of biomass conversion: the depolymerization of lignin. He pointed out a catalytic approach to convert β‑O‑4 lignin model compounds through a tandem reaction involving an acid catalyzed cleavage of the ether linkage followed by capture of the reactive intermediates through acetal formation, hydrogenation or decarbonylation. This chemocatalytic process can be applied directly to authentic lignin samples or even as a “lignin‑first” franctionation method of biomass feedstocks to provide moderate yields of monomeric products resulting mainly from cleavage of the β-O-4 linkages. Prof. de Vries emphasized how the development of advanced analytical tools is required in the field of lignin depolymerization to enable a detailed mechanistic understanding of which linkages are broken in novel catalytic transformations. This year’s poster session was followed by the keynote of Dr. Gautam Kalghatgi with “The Outlook for Transport Fuels”. He opened his talk by highlighting the importance of the transport sector for modern society but also its impact on global CO2 emissions and greenhouse gasses. Furthermore, he outlined the relevance of petroleum and liquid fuels, especially for heavy duty transportation, and mentioned the limited impact of alternative fuels within the next few decades. Afterwards, he explained the challenges of increasing the efficiency of spark ignition engines. With further downsizing and downspeeding engine knock becomes more likely and future fuels need higher resistance against knock. However, the Research Octane Number (RON) which is characterizing the knock resistance of gasoline fuels does not fully apply for modern engines, since phenomena like pre‑ignition and super‑knock can occur. Therefore, he mentioned the need for new characteristic fuel numbers. During the second part of his presentation, Dr. Kalghatgi focused on the challenges for modern Diesel engines where the trade‑off between soot and NOX emissions is the main focus of research. To avoid this trade‑off, he proposed using low Cetane fuels or gasoline compression ignition, since greater homogenization can be achieved and therefore soot formation can be avoided. PhD student Rene Büttgen, from the Institute for Physico-Chemical Fundamentals of Combustion (PCFC) RWTH Aachen University. He concluded his talk with an outlook on the fuel distribution for the next few decades where a strong tendency towards Diesel fuel was evident. Therefore, gasoline and low octane fuels will be available in abundance, making research on gasoline engines and GCI very important. The second day of the conference was opened by Prof. Robert Dibble from King Abdullah University of Science and Technology, who was giving a talk about “Better Biofuel Blending – Strategies for Optimal Blending of Biofuels with Petroleum Fuels to Improve Engine Combustion Performance”. In the beginning of his talk, he highlighted the importance of knock resistant fuels for spark ignition engines due to further downsizing and downspeeding trends in modern engine development. To obtain these knock resistant fuels, he presented several octane boosters which could be obtained from biomass. In addition to that, he presented a method to detect pre‑ignitions which would make it possible to enable counter measures like advanced spark timing. For compression ignition engines a similar approach as the one from the previous keynote by Dr. Kalghatgi was presented. Prof. Dibble as well proposed the use of low Cetane fuels in order to achieve better homogenization of the fuel‑air mixture to eliminate the soot/NOX trade‑off. In contrast to the previous keynote, Prof. Dibble was using fuels, which usually do not ignite in a Diesel engine and mixed them with ignition enhancers like the biofuel di ethyl ether. Prof. Dibble was followed by Prof. Roger F. Cracknell, who was giving a talk on the “Combustion Challenges in Designing Fuels for Modern Engines”. He started his talk by outlining the challenges for future mobility and a life cycle analysis of a series production car, where the tank-to-wheel emissions represent the biggest share of CO2. Furthermore, the importance of downsizing on efficiency was highlighted as in the previous talks. Moreover, he mentioned the importance of burning velocity, which has an impact on the knocking resistance as well as higher velocities are more beneficial. Another promising way to reduce emissions and to further increase efficiency are low temperature combustion (LTC) modes for compression engines. These combustion modes avoid areas where soot and NOX are formed and increase efficiency due to lower heat losses. During the second part of his presentation, Prof. Cracknell focused on deposits in the engine and on local emissions. Here the effects of injector fouling of gasoline and Diesel injectors on emissions and engine efficiency were presented. To conclude his talk, he highlighted the potential of knock resistant gasoline fuels with high burning velocities in order to increase efficiency. Additionally, he mentioned that novel combustion modes for compression ignition engines are very promising but also represent challenges regarding stability and noise. Finally he explained the potential of GTL fuels and biofuels to achieve locally lower emissions. The afternoon keynote was held by Dr. Hermann Pengg from Audi AG with a talk about “Emission Neutrality in the Transport Sector” in which he presented the opportunities of e-fuels. First, he outlined the need for liquid or gaseous energy carriers, since the transition to electric mobility will be too long and with e-fuels the current infrastructure can be used. Furthermore, with increasing amount of renewable energy like wind and solar power, huge amounts of excess energy will be available which have to be stored somewhere. For these reasons, a power to gas plant was presented which could fuel 1,500 passenger cars. This technology shows that it is possible to achieve a great reduction in greenhouse gas emissions for long range passenger transport and heavy duty. Finally, it was concluded that power to fuel in combination with electric cars is the only solution for a significant reduction of greenhouse gasses and that the power to fuel approach can also help with the big fluctuation in power supply of renewable energy. The final day of the conference included a keynote presentation from Prof. Johan Sanders from Wageningen University on the economic and social aspects of the biorefinery concept. He emphasized the importance of small-scale biorefineries as they allow for reduced costs associated with decreased feedstock transportation, capital costs and process energy requirements. However, for small‑scale production to be economically viable, a biomass feedstock must be carefully chosen to allow for the formation of a variety of high-value products (e.g. sugar, amino acids, lipids). Furthermore, Prof. Sanders outlined how the transition to a bio-based economy can also led to job creation in the agricultural and chemical sectors and thus also provide significant socioeconomic benefits. Not only the mentioned keynote sessions brought a lot of innovative input to the conference – many inspiring presentations were held during the various sessions. In total, 38 speeches were given in parallel sessions with 25 presentations being held by external speakers coming both from industry and universities from all over the world. 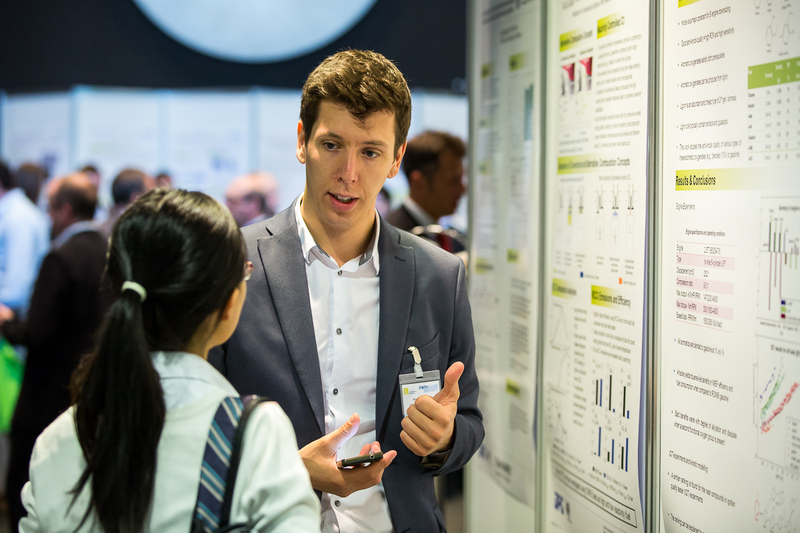 Moreover, the previously mentioned poster session, consisting of more than 30 diverse posters, extended the scientific value of TMFB’s 4th International Conference. The presented posters covered a wide range of topics. Ronny Uhlig was awarded for his outstanding poster on “Microbial Electroreduction of Biomass Intermediates to Tailor-Made Fuels” as well as Karin Munch for her inspiring poster on “An Analysis of Butanol and Octanol/Diesel Blends from Both a Sustainable and an Engine Point of View”. Besides the scientific input during the daily sessions, the conference offered the opportunity to establish and maintain contacts in a relaxed atmosphere in the evenings. The social program began on the first evening with a get‑together at the conference location, where food and drinks were served while the participants had the opportunity to watch the football match of the German Men’s National Team in the UEFA Euro 2016. The highlight of the second evening was the conference dinner, held at the Forum M in Aachen. All participants were invited to join the dinner and enjoy a picturesque view of the Aachen old town while musician Kathi Monta entertained the guests with her saxophone music. Taking a look back, the 4th International Conference bore the comparison with the previous conferences, which set a high standard. The organizers thank everyone who was part of the event and we are already looking forward to our 5th International Conference, taking place from June 20th to 22nd in Aachen. Once again, researchers who are interested in an interdisciplinary perspective on the development of novel biofuels and other alternative fuels are invited to take part. Vital discussions, diverse networking opportunities and a lot of valuable input are the main characteristics of TMFB’s International Conference, and we will be happy to share all these benefits with you again next year.